When employees volunteer together to address an issue or benefit a cause, amazing things can happen. U.S. Smokeless Tobacco Company (USSTC) and its parent company, Altria Group, have seen this first hand. In 2012, USSTC employees in Nashville built on their already strong culture of teamwork and caring by adapting toys for children with disabilities; building bikes for kids in foster care; supporting Metro Nashville Public Schools during Hands On Nashville Day; and more. 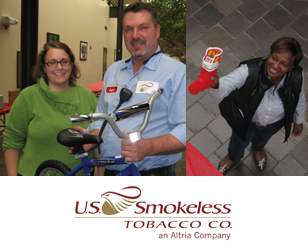 U.S. Smokeless Tobacco Company is the Civic Volunteer Group Award Sponsor for the Mary Catherine Strobel Volunteer Awards.